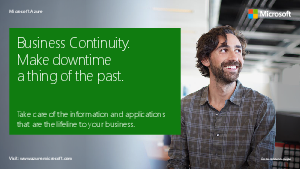 > Microsoft > Business Continuity. Make downtime a thing of the past. Your business, like many other small and medium-sized businesses (SMBs), is probably generating increasing volumes of data which you need to store. Your data is one of your most valuable assets which you need to back up and recover in the event of a disaster. Your data is vital to the continued operation and success of your business. And in a fast-moving and increasingly competitive world, 24/7 business continuity is crucial.